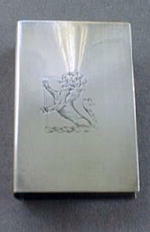 Offering this handsome sterling silver match box holder with a wonderfully detailed English dragon engraved on the front. Marked 'sterling' on the side. Measures 1 5/8" long, 1 1/4" wide x 1/2" deep. Good condition, very few slight wear marks, no dents. A beautiful piece for your collection! US Military Kipper Rolling Mechanics Tool Box Tan With Tools. Bambi & Friends - Disney/Capodimonte /Laurenz "MINT" Original Box - C.O.A.